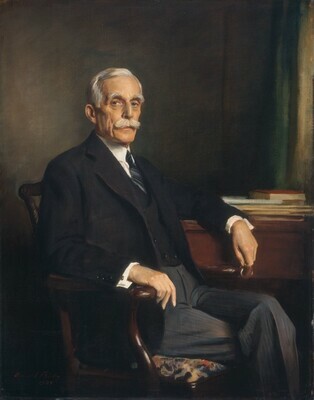 The sitter, Andrew W. Mellon [1855-1937], Pittsburgh and Washington, D.C.; by inheritance to his daughter, Mrs. Ailsa Mellon Bruce [1901-1969], New York; gift 1941 to NGA. Makers of History in Washington 1800-1950 [An Exhibition Celebrating the Sesquicentennial of the Establishment of the Federal Government in Washington], National Gallery of Art, Washington, D.C., 1950, no. 116, repro. Portraits of Personalities, Past and Present, Portraits, Inc., New York, 1952, no. 4. This New Man: A Discourse in Portraits, National Portrait Gallery, Washington, D.C., 1968, unnumbered, 154, repro. Fitzsimmons, James. "Famous Faces." The Art Digest 26 (1 February 1952): 17. Summary Catalogue of European Paintings and Sculpture. National Gallery of Art, Washington, 1965: 15. European Paintings and Sculpture, Illustrations. National Gallery of Art, Washington, 1968: 8, repro. European Paintings: An Illustrated Summary Catalogue. National Gallery of Art, Washington, 1975: 30, repro. Kopper, Philip. America's National Gallery of Art: A Gift to the Nation. New York, 1991: 36, 40, color repro.